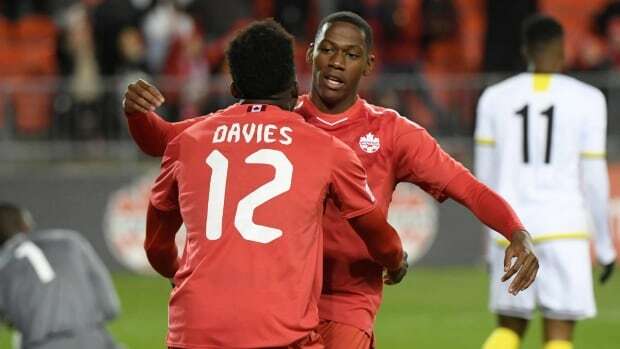 The rapid rise of Alphonso Davies has brought renewed attention to Canada's men's soccer program, and the soon-to-be 18-year-old appears to be living up to the hype. Even as Davies prepares for a highly anticipated move to Bayern Munich, the midfielder has been a productive member of the national team during CONCACAF Nations League qualifying. But, if the men's national team hopes to become a relevant player on the international stage, it can't just be Davies carrying the burden. Fortunately for Canadian soccer fans and executives alike, he's not alone. "Everyone is going to be critical in this journey to take us where we want to get to," head coach John Herdman said. "Everyone is going to have a big part to play and they're going to have to bring everything they've got to do something that hasn't been done in over 30-something years." Only one current member of the men's team — Atiba Hutchinson — was alive the last time Canada competed in a men's FIFA World Cup, in 1986. That amount of waiting can turn impatience into ambivalence, something Herdman hopes his charges can change with a spot in the 2022 tournament. "There's a spirit there, there's a team spirit where I think people are excited there's competition, and it's driving players to put a shift in in training," said Herdman, emphasizing the roles of both his young players and veterans alike, including new captain Scott Arfield. Some of the younger players beyond Davies are already carving out reputations for themselves. Cyle Larin made waves during his brief Major League Soccer career as a member of Orlando City before joining Turkish club Besiktas, while Jonathan David and Lucas Cavallini ply their trade with Belgium's Gent and Mexico's Puebla, respectively. All three have scored three goals in Canada's two Nations League matches. An 8-0 drubbing of the U.S. Virgin Islands in September, followed by a recent 5-0 win over Dominica are excellent opportunities for a revitalized team to show its potential. With that said, Herdman knows stiffer challenges lie ahead —especially for his defence. "This tournament, and the way it's formatted, [our] defenders aren't necessarily going to get tested at the level that we need them tested to fully understand what they're going to contribute when we come up against those Tier 1 and Tier 2 teams in CONCACAF," Herdman said. "Defensively, I'm not really going to get an understanding until we start coming up against those tougher opponents. It's like anything, you can't really test it until the test comes." Herdman's résumé is well-documented: the 43-year-old Englishman helmed the Canadian women's soccer team to consecutive Olympic bronze medals as well as gold at the 2011 Pan American Games before taking over the men's team. Herdman says the experiences of the last quadrennial leading up to the Rio 2016 Olympics helped shape his approach to the four-year stretch leading up to the next World Cup. "I think we've proved a lot of people wrong. They guys are buying into the same culture the women bought into to bring them success." That includes showing footage from the women's team during video sessions with the men. "I think it was positive," he said. "I mean, some guys maybe had the wall up a bit, like 'hey, what are you doing showing us [this]?' But I think it's been positive. "What they're seeing is a level of tactical IQ and a level of tactical excellence in big moments in front of 60,000 people in big games where you can actually see there's a level of team cohesion here, an attacking team cohesion that these guys have been yearning for, from what I can see." So what comes next for Canada? The team has two matches remaining in CONCACAF Nations League qualifying — against St. Kitts and Nevis on Nov. 18 and French Guiana on Mar. 26, 2019 — with Davies' move to Bavaria in between. As the fight to earn a spot in the 2019 CONCACAF Gold Cup continues, one certainty Herdman will have going forward is the commitment of goalkeeper Alessandro Busti and midfielder Ballou Tabla. Busti, who's spent most of his life in Italy and is a member of Juventus U23, confirmed his allegiance to his birth country with a start against Dominica. Tabla, who began his career with the Montreal Impact and now plays for Barcelona B, only recently committed to Team Canada after reportedly considering playing for Cô​te d'Ivoire. "I think people have been waiting with bated breath, those who had a chance to see him playing in Montreal breaking into the MLS," Herdman said of Tabla, remarking on the 19-year-old's one-on-one ability and "flair." "I think for most people there's a sigh of relief and then there's an excitement to actually see this young man play." Herdman is confident in the pieces he has, and in a sport where 11-person cohesion is vital, he'll need them all to be in sync. "There's so many good players in this group, all with different attributes and different qualities," Herdman said, "Some players will add more on the pitch with their individual brilliance, other players will add more off the pitch with their leadership. And even saying that, some of the players, the young players, will start to add more off the pitch than they ever added before. "I think it's a really exciting group."